At 6 p.m. on June 13, a parade of blue caps and gowns walked proudly into the Rothschild Multipurpose room. Students arrived in the MPR as ISTP 8th Graders, but would leave as ISTP alumni and high school students. For the occasion, the room was festooned with crêpe paper, balloons, and poster-sized portraits of each graduate. 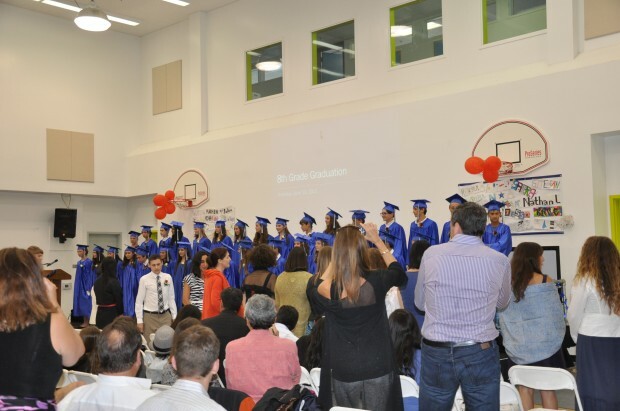 The beautiful, emotional graduation ceremony that followed celebrated our students’ achievements at ISTP, and symbolically launched our graduates into the world beyond. 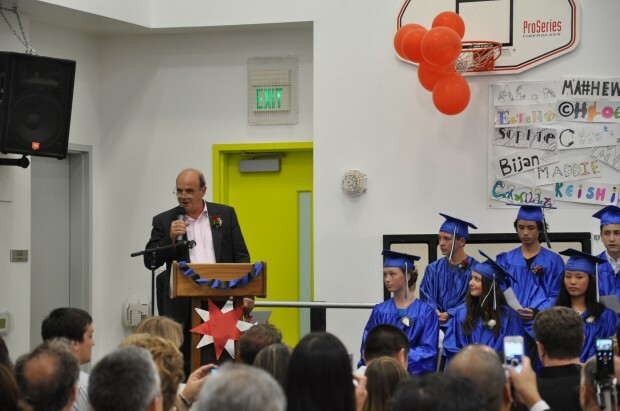 To begin, Head of School Philippe Dietz addressed the graduating class. He acknowledged that graduation brought about feelings of both joy and sadness, but above all feelings of pride. “Your parents are so proud,” Philippe said, “look at the smiles! Look at the iPhones!” Philippe personally thanked each graduating family for the central roles they played in their children’s success. He gave special thanks to long-term ISTP families, some who have been members of the ISTP community since the previous millennium! Philippe concluded his speech by urging students to become independent, and to learn to take care of themselves. Keynote speaker and ISTP alumnus Kyle Murao reminded students that in addition to becoming independent, they should also remember the ISTP community they came from – the community that shaped the person they are. Kyle spoke of how the language immersion experience at ISTP impacted him, and how it eventually led him to the opportunity to study at Sciences Po. Kyle related, “no matter how far I grew from the International School of the Peninsula, the lessons I learned there always stuck with me, because they were taught in a unique, unconventional way” that truly made an impression on his young mind. Next came the student speeches. 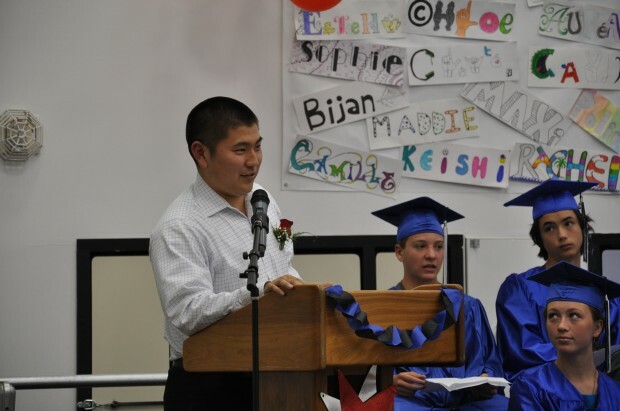 Each graduating 8th Grader delivered a two-minute speech in at least two, but often three or more languages. The student speeches really underlined just how unique ISTP is, and the incredible skills the language immersion experience gives our students. Public speaking is a challenge for any young person, but our students were able to confidently and eloquently express themselves in multiple languages. Students delivered emotional speeches expressing their gratitude to their families and friends for supporting them through the rigorous ISTP experience. Some students were saying goodbye to friends they had gone to school with since the age of three. One student summed up the huge role ISTP played in his life when he remarked, “I came to ISTP as a toddler, but I am leaving as a person.” For many students, cultural exchanges and other overnight trips were highlights of their ISTP experience. One sentiment that emerged time and again was the feeling that the 8th Graders were more than just a graduating class. As a result of their time together in the small ISTP community, they felt they had grown into a true family. Before Middle School Principal Barbara Greiner handed out diplomas, she recognized four students for outstanding G.P.A. and outstanding Citizenship. Alexander Boccon-Gibod and Keishi Foecke were congratulated for their outstanding G.P.A.s, and Georgia Bonini Wood and Eileen Faury were recognized for their outstanding citizenship during their time at ISTP. 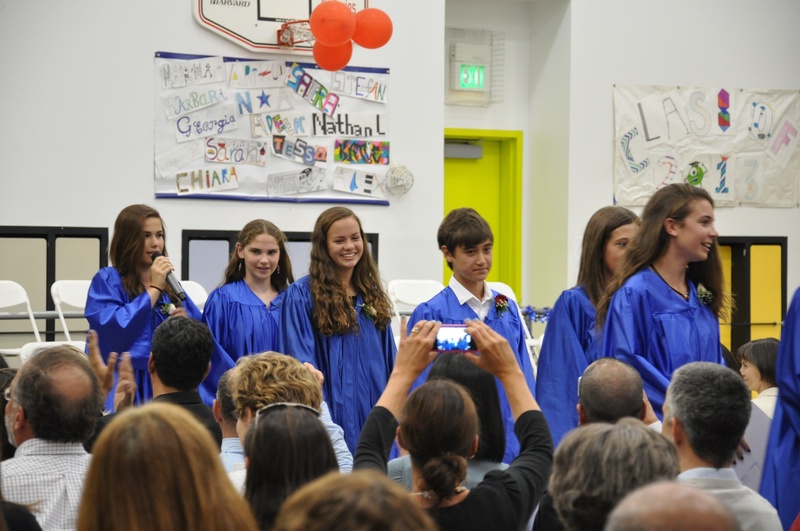 Finally, the handing-out of diplomas completed the 8th Graders’ emotional farewell to ISTP. ISTP would like to congratulate all of our graduates. We are very proud of you, and we know you are prepared for whatever challenges the future holds!